In this type, the flat machine table act as the basic reference surface. 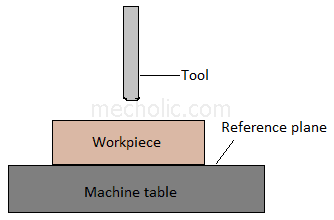 The machine table supports the workpiece, act as a stop and locating surface. If the workpiece does not have at least one flat side, the flat table cannot use as locating surface. In this type machine table act as the reference plane for location. 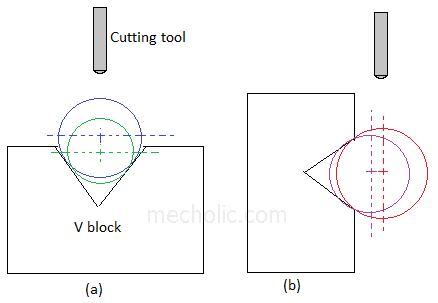 V block, conical locator are commonly used for locating circular workpiece. In V locator, the “V” should be directed in such a way that the variation of the dimension of workpiece will not affect the location. In Fig (a) the variation of diameter of workpiece will not produce an off-center. In fig (b) the difference in diameter produces an off-center, which is not preferred in the drilling operation. The workpiece is neither flat nor circular. If the diameter of workpiece varies from point to point or the surface is rough, then the surface is called irregular surface. It is advisable to use equalizers or adjustable rest pins to compensate the irregularity of surface. Fig shows two v-block locators, one is fixed, and other is movable (sliding v-block). ‘V’ with an angle 90° is the most commonly used v-block in jig and fixture.